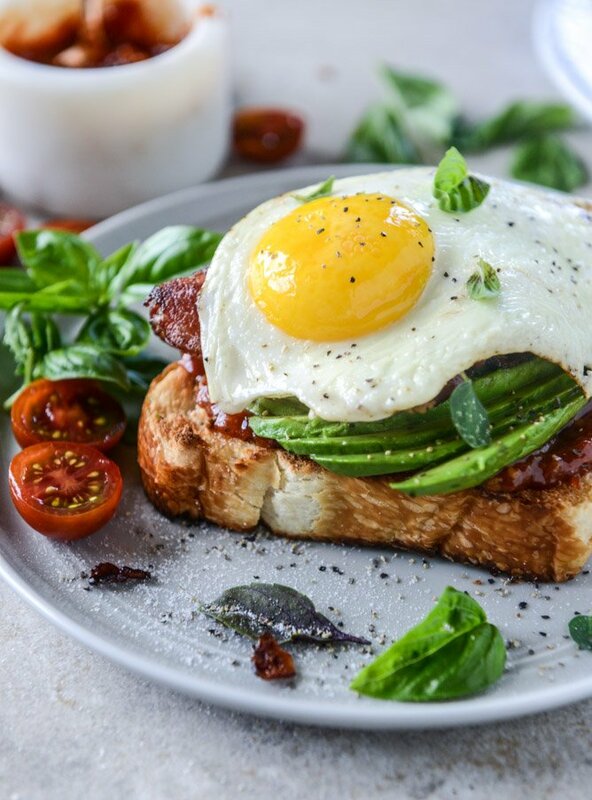 There are few things in life that excite me like an egg and avocado toast combo. Well… wait. That might be a lie. Lots of things excite me. Everything excites me. I’m the person that’s constantly told that I’m too excited, too dramatic, too guilty of loving the ­­­heck out of multiple things. Basically, I’m too extra of everything. AND I LOVE IT. My life is a constant stream of exclamation points. Says the person who has wanted to write in some form since she was seven years old. My old English teachers are crying inside. But really, any topping on toast excites me. TOAST itself excites me. You know I don’t love bread but I do love toast. Oh wait, bread is toast? Stop. No it isn’t. Sweet and savory, a thin layer of peanut butter or piled high with textures and ingredients, I don’t discriminate. Delicious things on crunchy toast? I have absolutely no resistance. 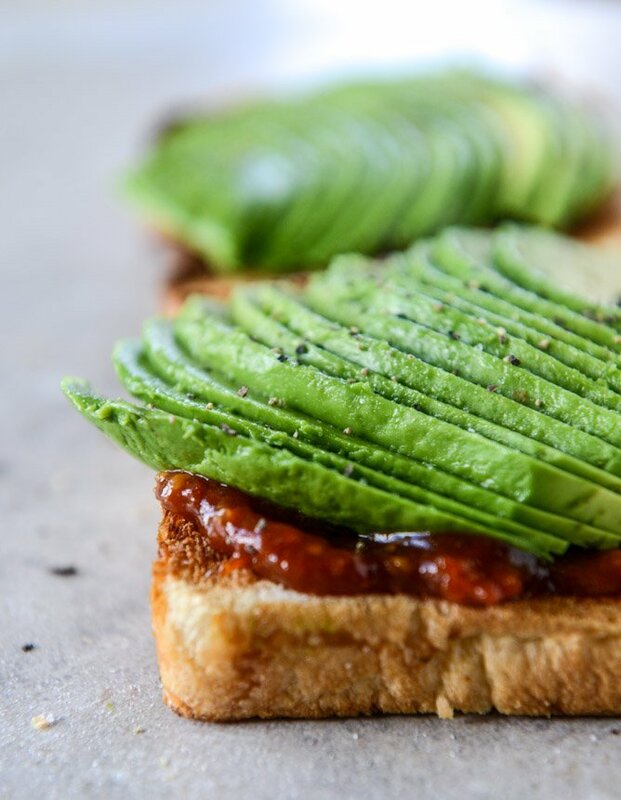 It’s one thing I could eat every single day, which is huge because as a millennial, I get bored with my food (life?) choices quicker than anyone else on the planet. I also might make huge sweeping generalizations (“every”thing, “every”one) about my peers who I don’t know, but that’s neither here nor there. Let’s talk about this jam! Can I call it jam? I’m calling it jam. I’m only calling it jam because American spoon makes an amazing heirloom tomato preserves and they didn’t have it yet when we were visiting last week. Apparently it’s being canned as we speak and I just can’t wait any longer. It’s extremely fabulous on breakfast sandwiches and mixed with bacon and eggs. It’s sweet and savory and ugh, just so, so flavorful. So I decided to make my own! It’s part of the whole impatient millennial thing. All you need are a bunch of cherry tomatoes, a touch of sugar, some lime juice and garlic. Cook it until the tomatoes burst and then keep cooking until the entire thing breaks down. You can puree it and then it will thicken as it cools. And then you can spread it on your ENTIRE LIFE. Wait! Look at this down there. Doesn’t it look like a face? Like one of those decorative owl faces? I’m not into owls. But now I might be. It was unintentional and I freaked. 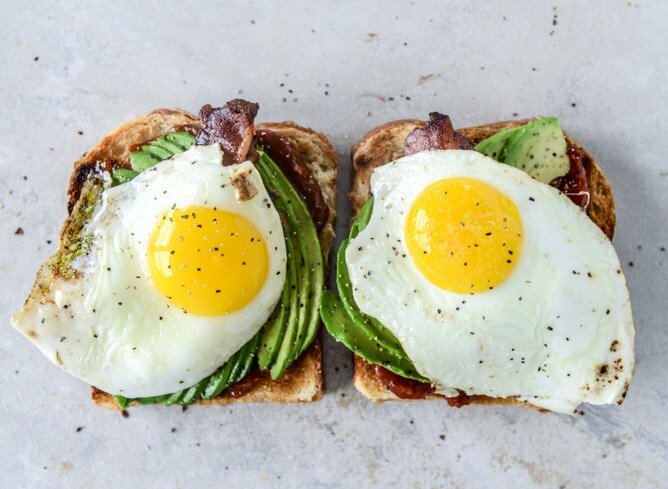 I’m not sure if I can convey just HOW delicious this combination is, but if you’re a member of the avocado + egg toast club (and oh I’m quite sure that you are), then you might be able to guess. Texture, taste, satiety – everything is spot on. And if you’re not a member, we’re always accepting newbies so come on in! The initiation is delicious. Heat a large skillet over medium-low heat and add the bacon. Cook until the fat is rendered and the bacon is completely crispy. Remove the bacon and place it on a paper-towel lined plate to drain any excess grease. Keep the skillet over medium heat and add the eggs to the bacon grease, cooking them over easy or as desired. Once the eggs are finished, season with a bit of salt and pepper. Thinly slice the avocado and sprinkle it with salt and pepper too. 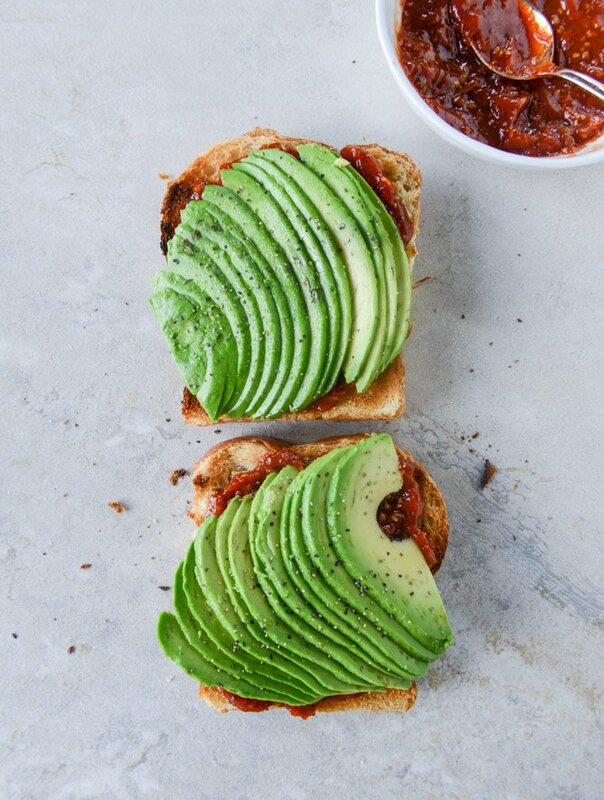 To make the toast, spread the tomato jam on one side. 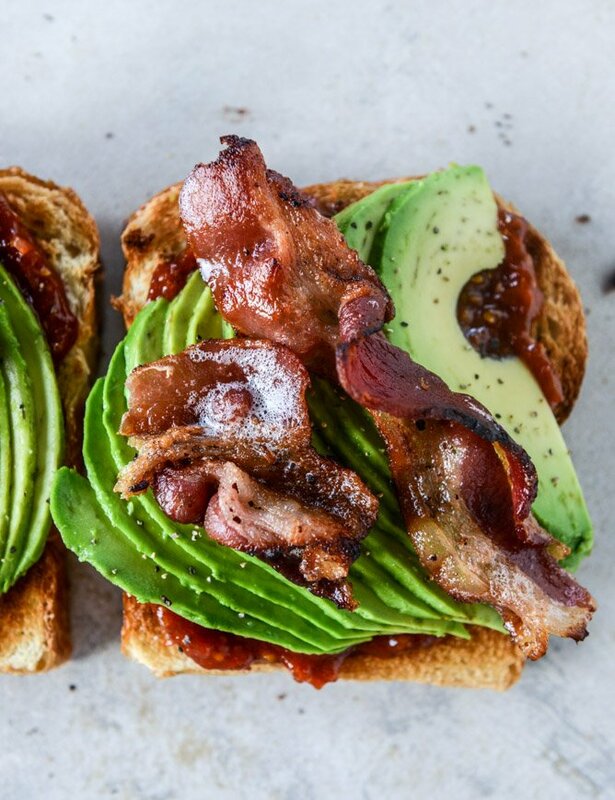 To with the avocado slices and then the bacon. 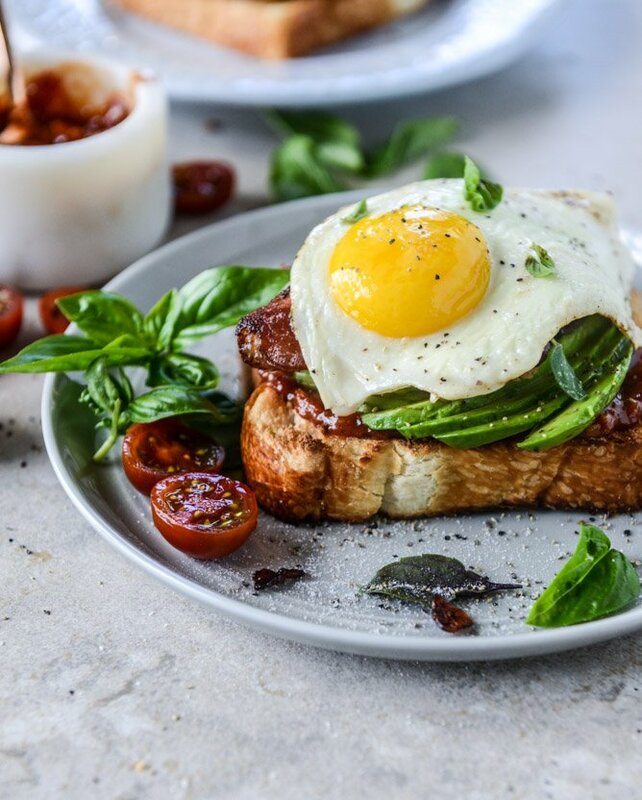 Throw the egg on top and sprinkle with fresh basil. Devour! 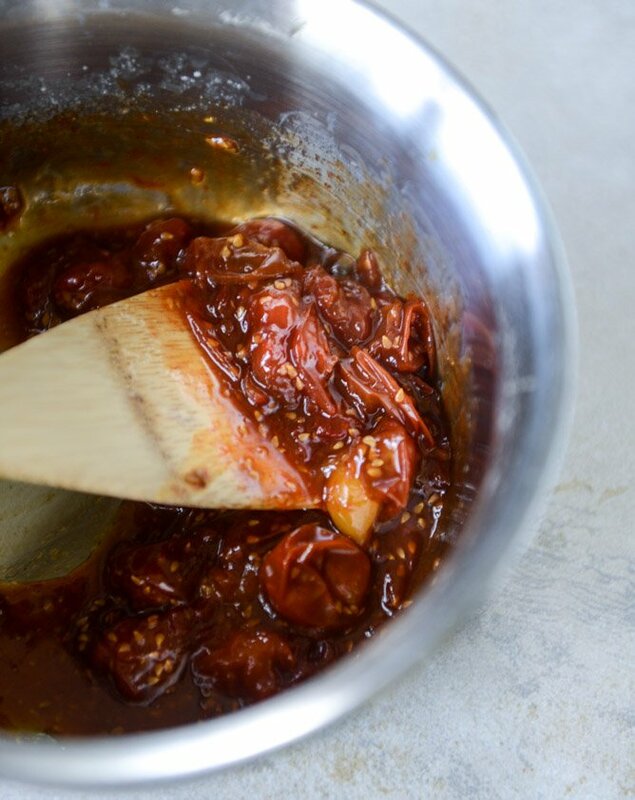 Heat a saucepan over medium heat and add the tomatoes, garlic, sugar, lime juice and vinegar. Stir often, cooking until the tomatoes begin to burst. Continue to cook as the mixture bubbles and the tomatoes break down, using a wooden spoon to break them apart if needed, about 10 to 15 minutes. Carefully transfer the mixture to a food processor or blender. Blend until pureed. Pour into a jar and let sit at room temperature until the mixture cools completely. It will thicken more as it cools. Once cool, store in a sealed container in the fridge. It’s like summer on a plate. 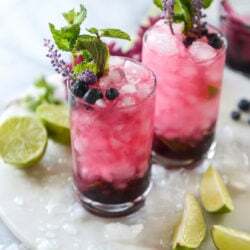 Blueberry Mojitos with Lavender Syrup. 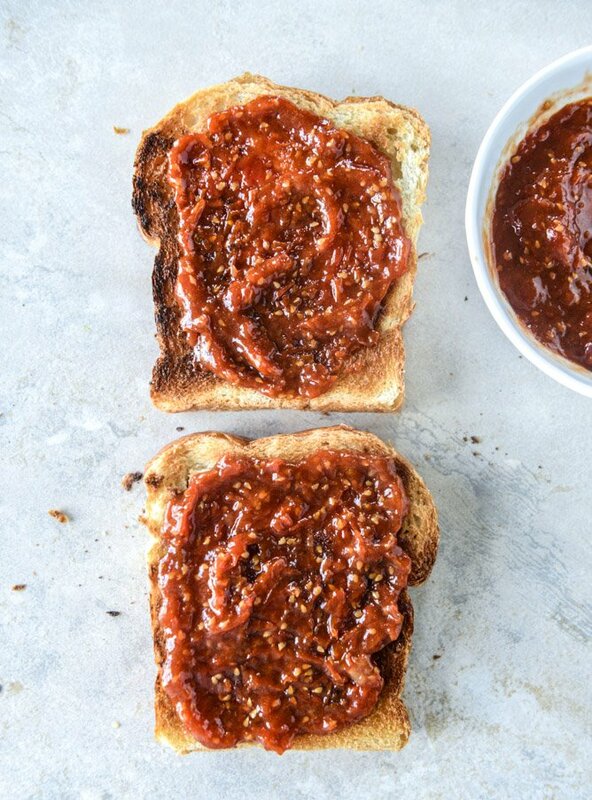 This tomato jam is to die for!! I could eat it by the spoonful straight from the jar. Thank you for the recipe, this is a keeper.